The recent decision by The British Museum to send a single sculpture from the famed Parthenon Marbles (or Elgin Marbles) on loan briefly to the Hermitage in Russia, causing outrage in Greece, has once again drawn attention to issues of cultural heritage relating to antiquities. Whatever the merits of the arguments put forward by those demanding the return of the marbles to Greece and those arguing for their continued care in The British Museum – and both sides have many valid points – there can be no doubt that the Museum has been a vital source of knowledge, stewardship and inspiration for those with an interest in classical antiquity, in a way that perhaps no other institution in the world has. Visitors to London may drop in at the Museum free of charge, as millions do annually (6,701,000 in 2013) and this writer has on more than one occasion, to marvel at the most exquisite works of antiquity from all over the globe, thoughtfully presented in a secure and pleasant environment. The current tempest over the brief loan to the Hermitage seems a good opportunity for a broader review of the British Museum’s ancient Greek holdings. Every medium and material is presented in their displays, including sculpture in stone and bronze, ceramics and terracotta, glass and organic materials. The collections reflect the broad sweep over time and geography of Greek influence in the broader Mediterranean world. In this brief photo essay, I have entirely left out the Parthenon marbles and have selected 15 images that are personal favorites and I hope capture a sense of the complexity of ancient Greek art. I have focused only on Greek art from the Archaic through Hellenistic periods and have incorporated works not only from Athens and other important centers in Greece itself but also in regional styles from Greek communities in Asia Minor, North Africa and southern Italy. 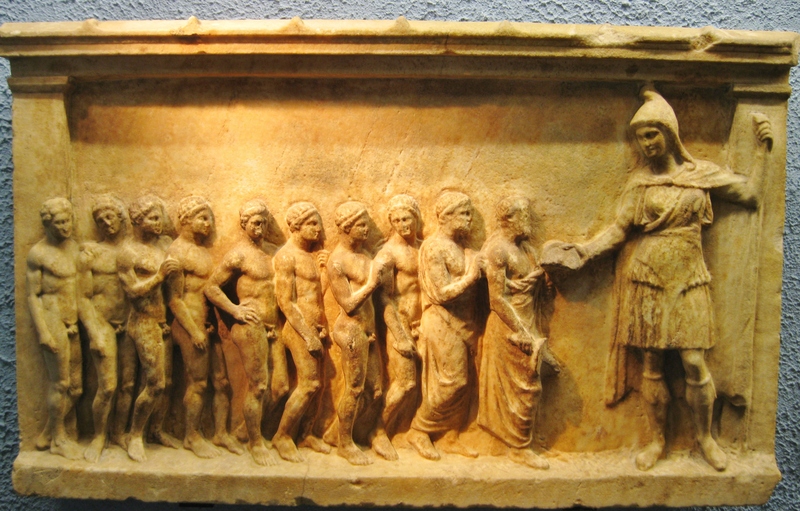 All images are original and should be credited to Clio Ancient Art and Antiquities. 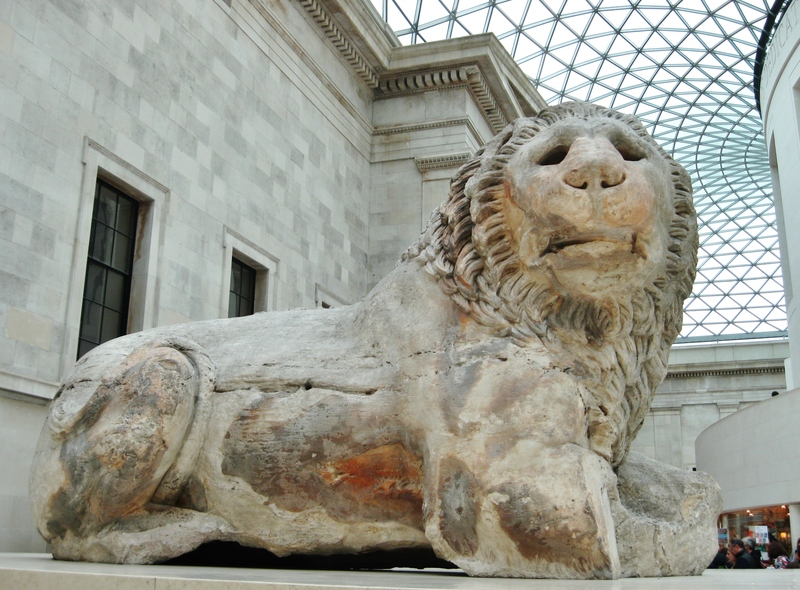 7 Ton marble lion from a Greek monumental tomb at Knidos (now in SW Turkey). The lion once stood atop the tomb, overlooking the sea approach to Knidos. The marble used is Pentellic and was brought from near Athens. The now hollow eyes were once filled with glass or metal to reflect the light. There is debate among scholars as to the age of the tomb, which survived only in fragments when uncovered in 1858; some attribute it to about 350 BC while another school of thought puts it in the middle Hellenistic period. Now residing in the interior court of the British Museum. 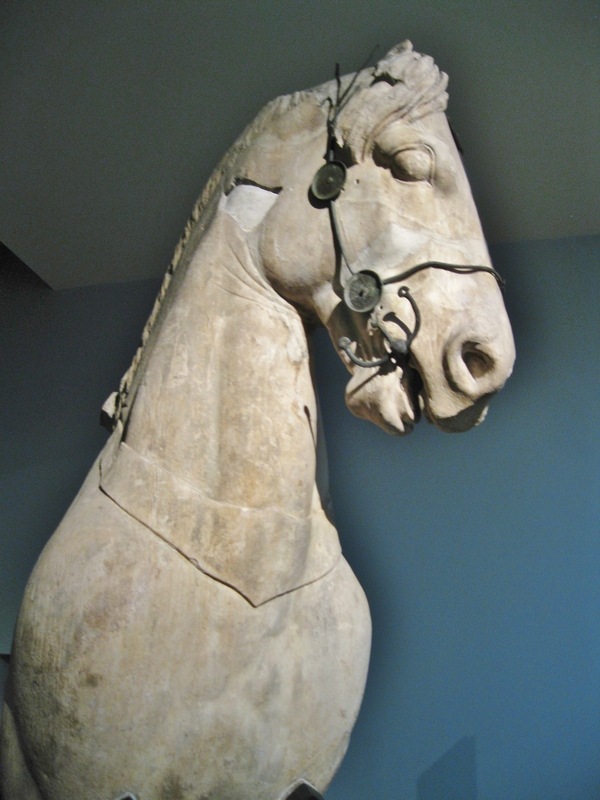 Forepart of a monumental marble horse from the chariot group that once surmounted the podium of the famed Mausoleum at Halicarnassus, Circa 350 BC. This and a few other fragments in the British Museum, along with some in a small museum near the site, are all that remain of the sculpture that once adorned the Mausoleum. pilfering of usable stone blocks in antiquity and in the middle ages by local inhabitants and invaders, and burning of the marble to make lime plaster, as well as earthquakes, all left the great building shattered. Excavations in the 1960s showed that the burial chamber below ground had itself been looted in antiquity. 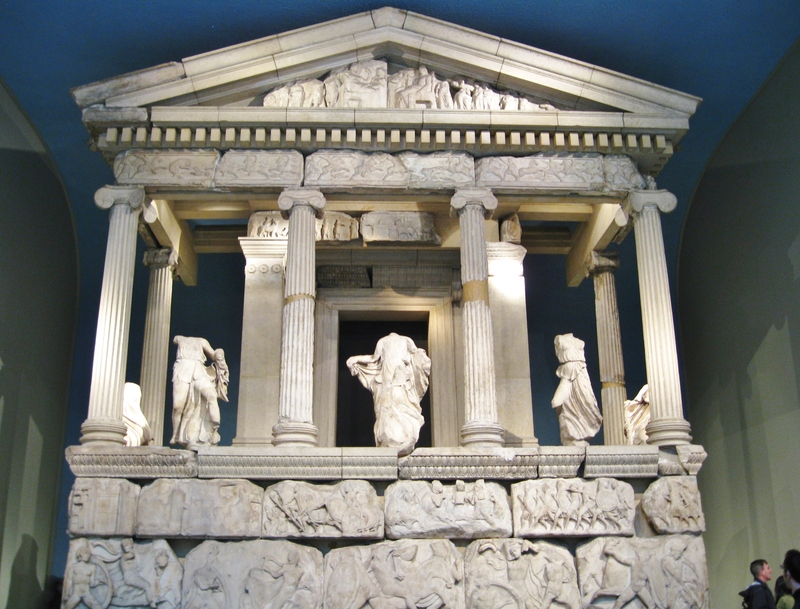 The Nereid Monument, finest of the Lykian tombs found at Xanthos, in what is now SW Turkey. Dated to about 390-380 BC, it is named for the statues of the Nereids, daughters of the sea god Nereus, between its columns. It reflects strong influences from both Greece and Persia. It is the first example of a temple-tomb in the region, the greatest of which would be the Mausoleum of Halicarnassus. 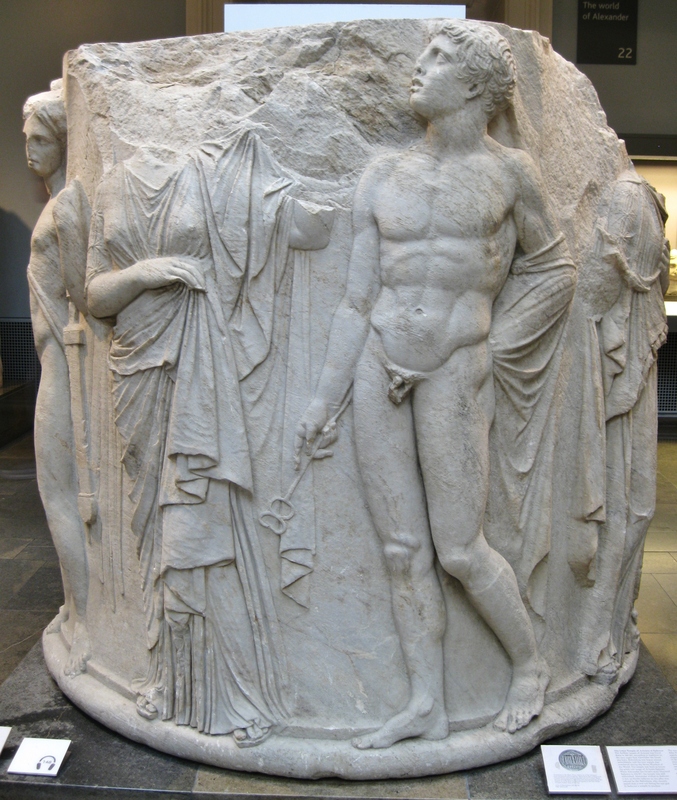 Marble column drum carved in high relief, from the second Temple of Artemis at Ephesus, circa 330 BC. The lost site of the Temple was rediscovered after a long search in 1869 and many fragments, that would no doubt otherwise have been used by local people as construction material or burnt for lime, were sent to the British Museum. 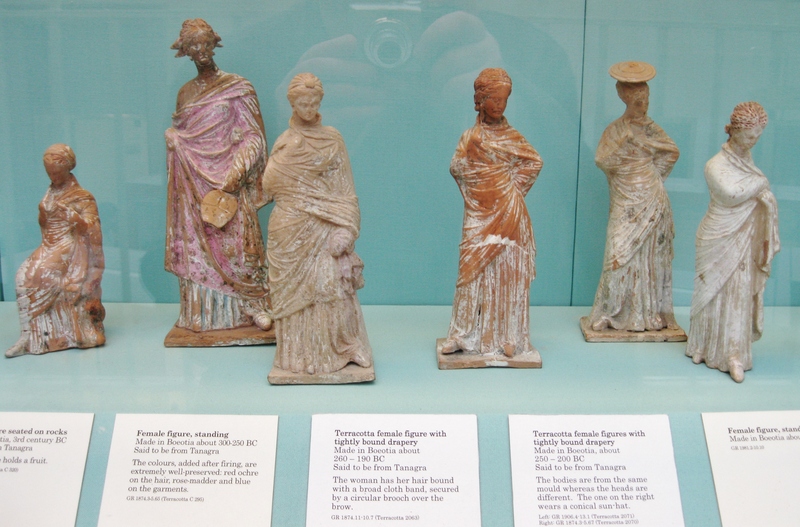 Tanagra terracotta figurines (named for the first find-spot of this type of figurine), some with polychromy remaining on the surfaces. All 3rd and 2nd Century BC. See the descriptive labels for details of each. 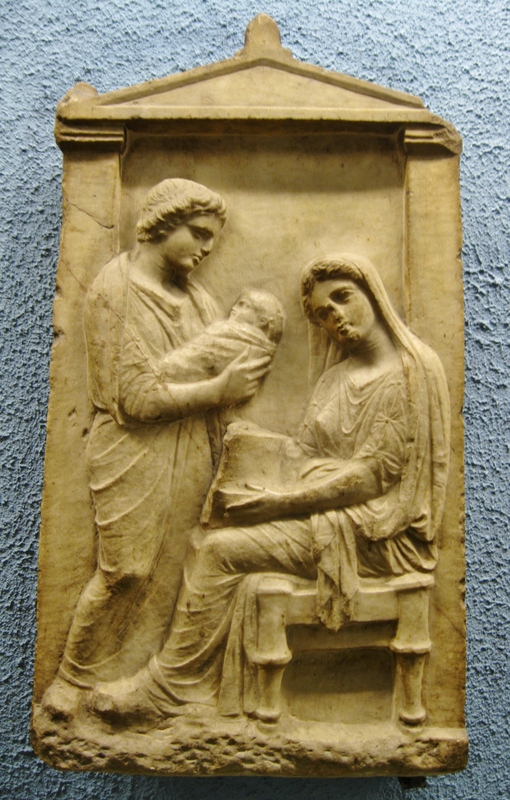 Marble votive relief dedicated to the goddess Artemis Bendis. Found at Piraeus, the ancient and modern port of Athens. Bendis was a Thracian goddess, similar to the Greek Artemis, whose cult was introduced to Athens around 430 BC. She is shown here on a larger scale than her mortal worshipers, who may be athletes participating in a torch relay in her honor. This piece dates to about 375 BC. 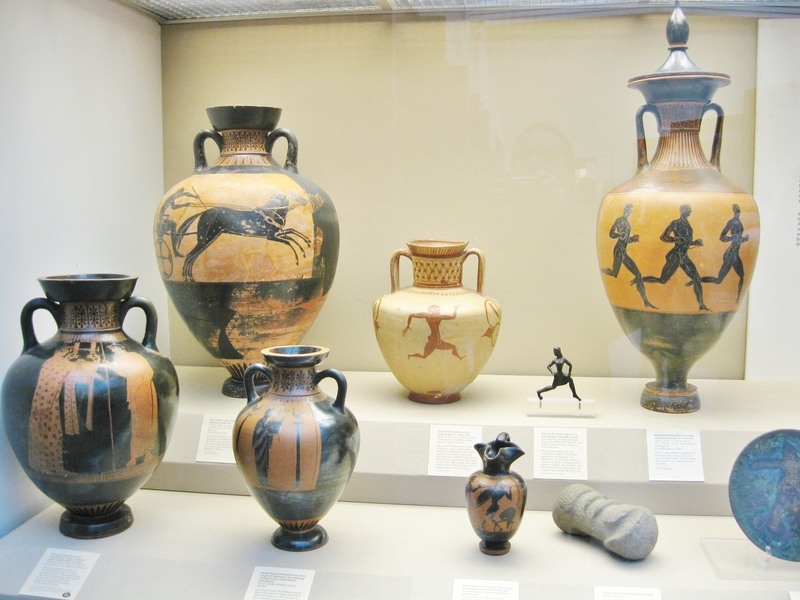 The red figure and earlier black figure pottery shown here are all prize amphorae. Filled with the finest olive oil, these were given to winning athletes in regional or civic competitions. They often depict the type of event for which they were given, such as foot races or chariot races. Mainly late 6th and 5th Century BC. A white ground jug made in Athens in the early 5th Century BC. The woman is depicted holding a distaff in one hand while she uses the other to separate the fibers that will be spun into thread. 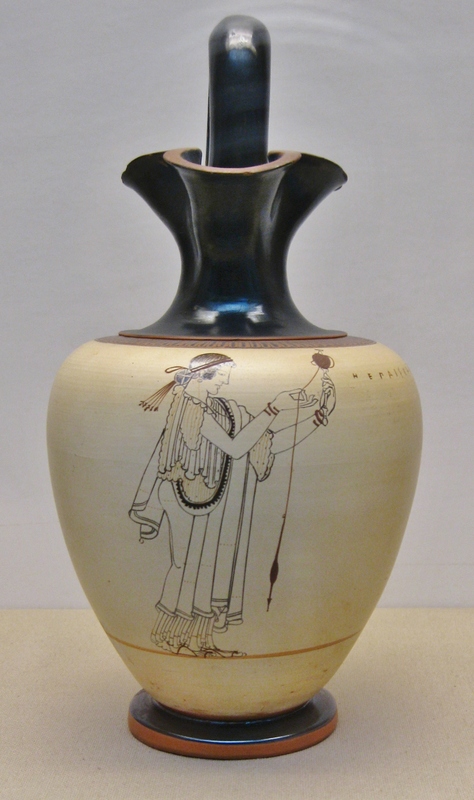 White ground vessels are far less common than the typical black figure and red figure pottery of classical Athens. This is one of the finest Attic white ground vases I have ever seen, on account of its excellent preservation and fine line drawing. 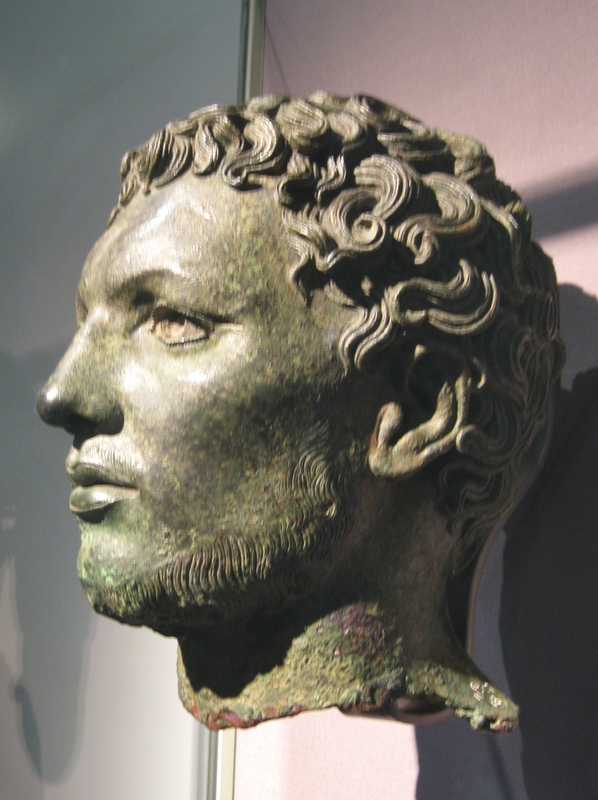 A stunningly realistic cast bronze head of a North African man, possibly a native Libyan. From the Temple of Apollo at Cyrene, Libya, about 300 BC. It was found with fragments of bronze horses, suggesting it may have been part of a monumental equestrian group. The separately made lips were originally covered in copper sheet, the pupils of the eyes made of glass, the whites of the eyes from magnesium carbonate. The eyelashes were also separately cast and attached. Apotheosis of Homer. From a temple in honor of Homer at Alexandria, Egypt. Marble, later 3rd Century BC. Reading and reciting Homer was an essential part of Greek education and he was honored as a god in the Hellenistic period. A superb and complex example of early Ptolemaic sculpture, this fragment comes from a temple erected by Ptolemy IV Philopater and his Queen, Arsinoe III. They are shown in the bottom left corner behand the seated Homer. An altar is placed before Homer and worshipers come in procession. 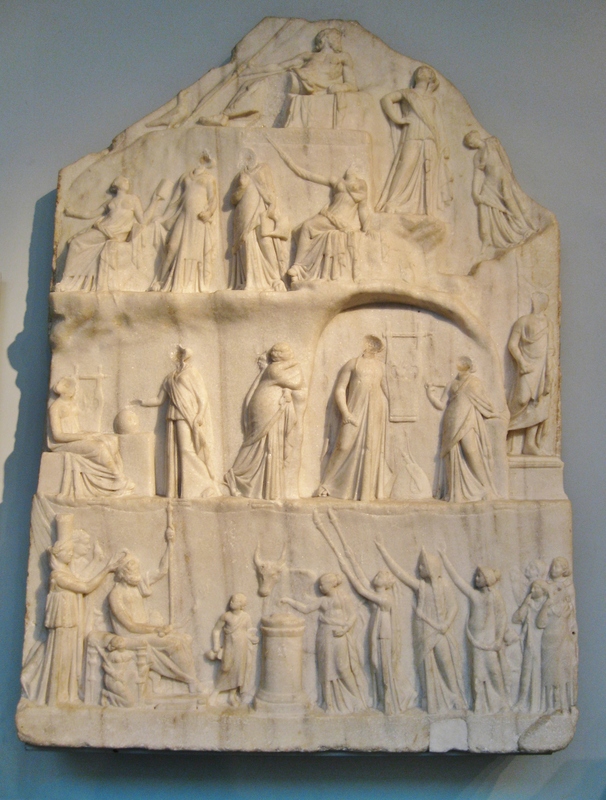 Other figures on the sculpture include key characters from the Iliad and Oddysey, his 2 great epics, and the 9 Muses. An elaborate pottery askos of native Italic form from the Greek colony of Canosa, Italy, 270-200 BC. In addition to the separately made figures attached, much of the original polychromy has survived. Painted in pink are 2 marine horses flying over a brown sea, while 3 figures of Nike are attached to the false spouts and handles and the foreparts of 2 horses to the wall of the vessel. Relief images of Medusa and a dancing Maenad also enhance the vessel. 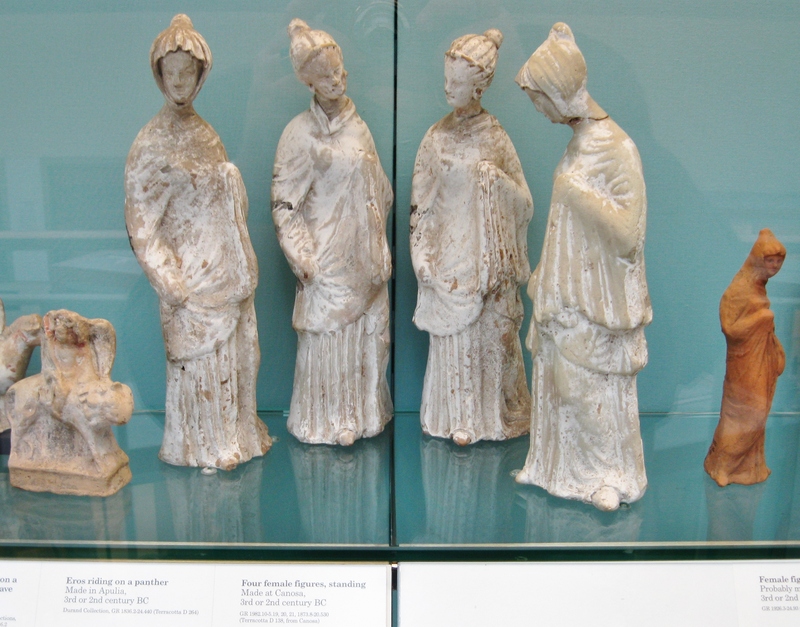 Terracotta figurines from Magna Gaecia (the western Greek colonies), 3rd and 2nd Century BC. See the labels beneath each for details. A variety of red figure vases with applied white and red on a glossy black slip. 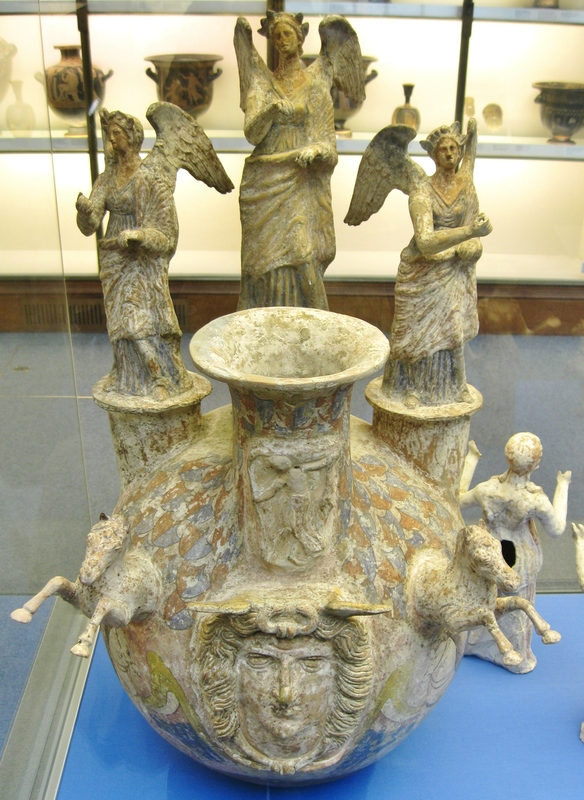 Known as Gnathian Ware, these were produced in great numbers in the Greek colonies of South Italy. These examples date to about 350-320 BC. East Mediterranean Hellenistic glass bowls made by slumping a round blank of hot glass over a negative form and applying canes and / or chips of contrasting glass until they fused. Despite being expensive to produce, these were widespread in the Mediterranean world. 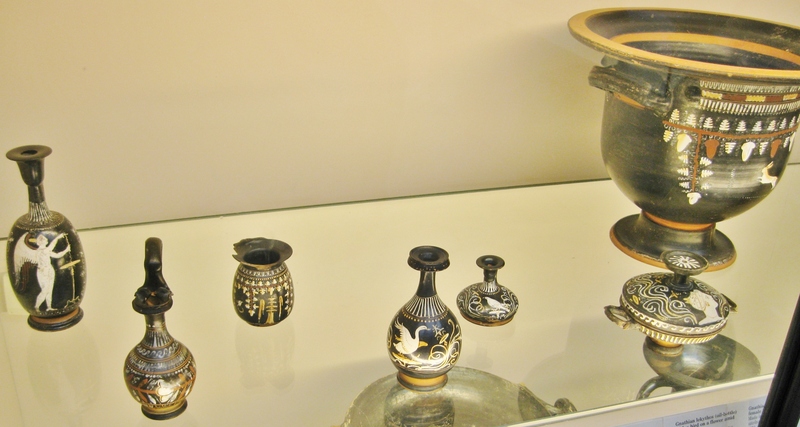 They were eventually replaced by the introduction of less expensive blown glass in the early Roman period. These date to between 125 and 50 BC. Next Post NEWS ITEM: Five people buried in the Amphipolis Tomb!